The Oceano Dunes, Central Coast and Oceano Airport (L52). There are avid skiers in southern California who love the winter snow so much that the resorts make snow in the mountains if none falls. But along about March, these same ski buffs and snowboarders begin to long for sun and surf on un-crowded beaches next to sparkling blue waters under azure skies. The airplane is a magic carpet that can take you on a short but scenic flight of an hour or so from Van Nuys to a 15-mile-long, broad, glistening sand beach right next to Oceano Airport. If you want to have some fun ‘n’ sun—California style—spend a day or more on this sunny coast, where you can camp, swim, fish, golf, play tennis, go for a horseback ride or All Terrain Vehicle drive on the beach, or simply picnic and watch seagulls soaring and diving. You’ll find Oceano, just three short blocks from the beach on the shores of the central California coast, between San Luis Obispo Bay and Vandenberg Air Force Base, a visitor-friendly airport. Oceano is 125 nautical miles from Van Nuys Airport. The shortest most scenic route will take you over the San Fernando and Simi valleys to Fillmore and then over Ojai and crater-like Lake Casitas, with its island in the middle. The route on Victor Airway 386 connects to the San Marcus VOR high over the razor ridges of the Santa Ynez Mountains in the Los Padres National Forest. From that vantage you can, like a California condor, overlook Santa Barbara Airport, way down in Goleta, Calif. The route then takes you over Lake Cachuma and Santa Ynez Airport northwest toward Santa Maria Airport. Just past Santa Maria you should be able to spy the 15,000 acres of the Oceano Dunes State Recreation Area, on the coast. Head straight for the dunes. Oceano Airport, just to the north, will probably be bathed in sunlight under a clear blue sky. A call in to Oceano’s Unicom/CTAF will yield a friendly response about the wind and traffic. A visually stimulating air tour can be had before landing at Oceano by flying northwest off the coast from just south of Oceano to San Luis Obispo Bay and back. This gives passengers on both sides of the plane a bird’s-eye view of the shore and towns. There is one long continuous stretch of beach here. Grover and Pismo beaches are associated with towns of the same name. Shell Beach is further away and has mostly bluffs overlooking the sea. You’ll want to stay high enough to avoid any chance of midair gull-strike and well offshore so as not to violate regulations concerning minimum altitudes; also, watch out for Oceano Airport traffic and ultralights. The prevailing winds are generally from the west-to-northwest so an entry on a 45 to a left downwind for runway 29 also gives passengers a good view of the beaches, towns and coastline. There are no obstacles on final other than the horse stables at the approach end, and you can easily land and turn off the runway halfway down and taxi to a tie-down. Oceano Airport (L52) is an uncontrolled San Luis Obispo County facility with a paved and lighted runway 11/29 (2,300 X 50 feet) at 14 ft. msl. Fuel is available, but maintenance only on an emergency basis. Tom Ramler, the airport manager, a rugged, good-looking redhead with a big grin and friendly mien, owns the pleasant baritone voice on the telephone and radio on weekends. During the week, his father, Harold, mans the Comm. If you ask about the chances of renting a car or getting a taxi, you may be offered Ramler’s “previously owned” Cadillac to go to your motel in Pismo or Shell Beach, if it’s available. You can return it later after you have checked into your lodgings. Now, that’s hospitality! Oceano Airport tie=down and ramp. This area, called the Central Coast, is roughly midway between San Francisco and Los Angeles. Hugging the coast are the towns of Grover Beach, only two miles to the north of Oceano, Pismo Beach one mile further, Shell Beach two miles further northwest, then Avila Beach and Port San Luis. Since the towns are quite small and close by the beaches, once you are situated, most everything is within walking distance and a car isn’t necessary or even desirable. If you just like to have a car at your disposal however, to run up to San Luis Obispo (heck, you could fly there), Morro Bay or the Hearst Castle at San Simeon, for instance, car rental is available in nearby Grover Beach with free pickup at Oceano Airport. Some hotels and motels provide free pickup at the airport. Also, a Coastal Cruiser Trolley runs hourly from the airport to “hotel row” and the other areas for the paltry sum of 50 cents per passenger (children under 6 free). All are a short taxi ride from the airport, if you like privacy in your ground transportation. There is also a grassy campground on the airport itself. If you’ve got a tent and/or sleeping bags, you’re all set, or you can rent them from the airport office. The airport even has showers and laundry facilities for campers. Chumash Native Americans were in this area when Europeans first explored the region in the late 1700s. The town of Pismo Beach derives its name from a Chumash word meaning “blobs of tar,” which foretold the discovery of oil beneath the waters off the California coast. The Chumash, active fishermen, used the tar for sealing their boats, and the clams found under the sand were first “mined” by them. Old Juan’s Cantina in Oceano. Pismo Beach is famous for its clams. At one time they were harvested up to 45,000 per day by commercial fishermen and that merry little devil, the ravenous sea otter. In the late nineteenth century the railroads came, and with it many settlers. Oceano became a Mecca for the “hippies” of the 1930s (yes, they had them then): artists, freethinkers and nudists called “Dunites” by the otherwise square locals. You won’t see many of those there anymore. Glenda Guyton of Oceano graciously provided an “Early History of the Oceano Airport” written by her husband, Harold Edgar Guyton (copyright 1993). It tells of the days when barnstormers used to land and take off from the coastal beaches in the 1920s and 1930s, probably in old Curtiss Jennies, attracting potential riders and many spectators. The beach was at times a tempestuous environment due to occasional storms, much vehicle traffic and vandalism. The planes suffered corrosion from the salt-laden moisture, so they looked for a more suitable landing strip, inland but nearby. An undeveloped plot was found at the present site and Harold Guyton, who aspired to become an aviator, offered to clear the willows off the land with his father’s bulldozer, in exchange for flight instruction. The offer accepted, an 800-foot by 60-foot grassy strip was cleared but was soon extended to 1,000 feet long after one of the fliers almost took down power lines at one end of the runway. Within a couple of years enough other local fliers had based pre-war and WWII surplus aircraft there to attract county and federal officials. The Civil Aeronautics Authority made funds available for the county to acquire adjacent land to expand the airport. The grass strip was further extended to 1,500 feet in length, and in 1951 it was further lengthened to 2,300 feet and paved. Walter Fell, a former manager of all of the San Luis Obispo County airports from 1951 to about 1970, said the sea was literally jumping with fish in the 1950s when Avery Blanchard moved a Quonset hut on to the airport and then moved into it. He flew out of there doing fish spotting and established the first fixed base operation at the airport. Later, as the Central Coast became a rich agricultural region, one of Blanchard’s sons adapted the aircraft to do agricultural spraying. As the great Central Valley, the San Joaquin, became more agriculturally productive, it began to eclipse the Central Coast, so the crop dusters moved inland to airstrips in Bakersfield, Delano and Porterville, but pleasure seekers began to discover Oceano’s delights. It’s rumored that many of the Hollywood celebrities from the 1930s on “discovered” the area as a place where they would not be noticed, and flew into Oceano to privately enjoy the sun and surf, scent of the salt sea and the sight of gulls gracefully banking and wheeling about. In Oceano, across the street from the airport, there is a large and lovely duck pond and children’s playground where you, your passengers and the children can stretch their legs after the flight. 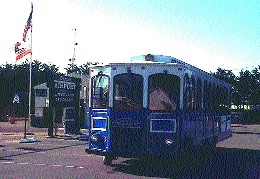 The Coastal Cruiser Trolley outside Oceano Airport. Also, hungry pilots and passengers will find that restaurants of many cuisines abound. There are four within four blocks of the airport and many more in Pismo Beach itself offering fresh seafood, steaks and chops, Italian, German (Shell Beach), Chinese, East Indian and American western cuisine. Of course, there is “fast food” for those in a hurry. At Old Juan’s Cantina, only three blocks away, toward town, you can enjoy a highly creative Sunday brunch, with champagne, on the patio in the shade of an umbrella. The decor is new “old” Mexico inside and out, and the service and food are excellent. Excellent clam chowder is available at any time at most restaurants. The Pier Ave. Café, two blocks away toward the beach, was the winner of the clam chowder competition at the October ’98 Pismo Beach Clam Festival, and offers theirs in a sourdough bread bowl, while you’re being refreshed by cool ocean breezes. Then there is the Rock & Roll Diner in a train car decorated in a 1950s theme, also within walking distance of the airport. Okay, so you’ve had your fill of good food. Now what do you want to do? Go horseback riding on the beach? The Silver Spur Livery Stable folks (at the approach end of runway 29) will pick you up at the airport ramp and bring you back when you’re done having fun. Prefer an ATV ride on the beach? B.J.’s ATV Rentals in nearby Grover Beach will provide the same service. Go for a swim? You can change at the airport’s shower facilities and walk to the beach. You could spend many hours, perhaps days, exploring the Oceano dunes, the most extensive coastal dunes in California, with its native plants such as the arroyo willow, sagebrush, verbena, bush lupine, surf thistle and giant coreopsis in the protected region south of Oceano. If you have never been in an open cockpit airplane, you might want to check out Banner Airways at Hangar C on the airport. J.R. Smith has a beautiful bright yellow Super Stearman that can take you for a ride to explore the dunes by air, the coast and piers, or all the way to the Hearst Castle at San Simeon, or just do a few Whifferdills (two or more coupled aerobatic maneuvers) for the fun of it. Visit his website at www.bannerairways.com or call (805) 474-6491. The Great American Melodrama & Vaudeville Theater on Front Street, only a quarter of a mile from the airport, puts on shows from Wednesday through Sunday. Presently, they are putting on “Musical Comedy Murders of 1940,” which pokes fun at show biz of that era. It’s followed by a hilarious vaudeville show by very talented actors. There are usually many children in the audience and everyone seems to enjoy the show, which takes about three hours. Food and drink are available during the two intermissions. For information and/or reservations call (805) 489-2499. There’s also bingo at the Elks Club, two blocks from the airport. 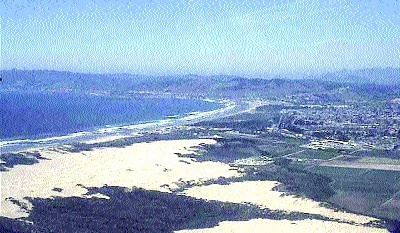 In Grover Beach, the Pismo State Beach Golf Club runs alongside a stretch of sand dunes and is just south of the Pismo State Beach North Beach Campground. The Monarch Butterfly Grove in Pismo Beach, on the border of Grover Beach, is only one and a half miles up the beach from Oceano. From October through February, the grove is an amazing sight with thousands of these intricately and gloriously colored creatures perched on the branches of the Monterey Pines and Eucalyptus trees, until the sun warms them, whereupon they take off and flutter all around. They flutter in over the Sierra Nevada Mountains from west of the Rockies and down from Canada seeking, as you do, the warm sun. If you’ve checked into lodgings in Pismo Beach, you might want to get a license to dig for clams (up to a legal limit of 10). If you don’t have a clam digger you can buy or rent one at Pismo Bob’s Hardware in town. The view south from Pismo Beach pier to Oceano. Besides a Mardi Gras Jazz festival in late February and classical concerts in late March, Pismo Beach is busy with lots of shops and galleries featuring paintings and jewelry. There are also antique shops close to the airport and in Pismo Beach. For a weekend or longer stay there are more than 32 hotels, motels, lodges and inns in Pismo and Shell Beach, 18 of them within two blocks of the shore, or right on it. 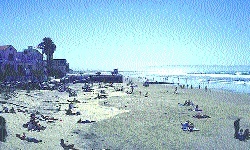 Oceanfront hotels offer a view of the arc of beaches all the way to San Luis Obispo Bay. The Sandcastle Inn, on the beach at the Pismo Beach pier, will lodge your “best friend,” so bring “Fido” along on the trip; dogs are legally allowed to dash happily up and down the beach and in and out of the surf. Just don’t forget to bring along the “scooper.” Call the inn at (800) 822-6606. 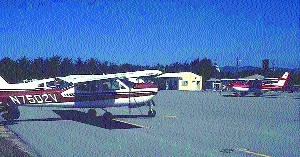 For Oceano Airport conditions, tie-down fees, availability of camping facilities, etc., call (805) 473-2001, or visit www.aircamp.com for a live picture of airport conditions, day and night, updated every minute. For information regarding lodgings, transportation, restaurants, entertainment and recreational activities call the Pismo Beach Visitor Information Center at (800) 443-7778. For a holiday you’ll never forget, get on that magic carpet and fly to Oceano!